This book consists of a dialogue between a young psychoanalyst, Luca Nicoli, and a renowned teaching analyst, Antonino Ferro. It touches upon many of the key areas of contemporary psychoanalysis: setting, technique, theory, as well as post-Bionian models and the 'BFT' - the famous Bionian Field Theory devised by Ferro. Using a friendly informal style, Ferro and his colleague Nicoli challenge the certainties of orthodoxy, leading the discourse toward the unknown and the as yet undiscovered. Both young and experienced analysts will find not only practical advice in this book, but also challenges to their own theoretical and emotional assumptions in the unexplored, ever-changing encounter with the patient. Reading this guide is guaranteed to make them reassess their working methods. 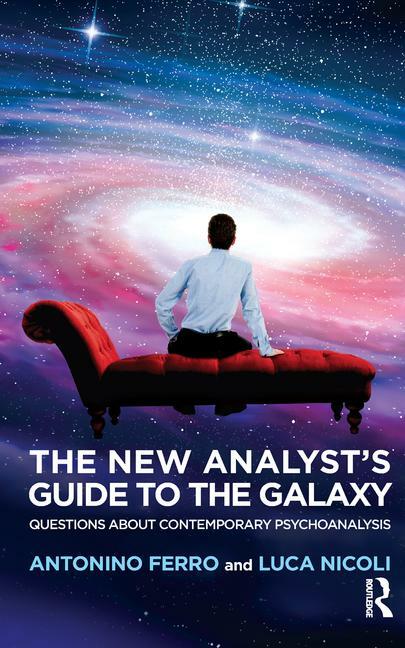 "The New Analyst’s Guide to the Galaxy is perhaps the most engaging, intelligent, refreshingly irreverent, witty discussion of psychoanalytic theory and practice that I have ever had the pleasure of reading. The conversation between Nicoli, a relatively new analyst, and Ferro, one of the most highly regarded analysts of our time, moves gracefully between “everyday” clinical matters, such as the analyst’s cancellation policy, and large theoretical matters such as the diminishing importance of Freud’s work to contemporary analytic thinking and technique. This book is a gem that should not be missed by any analyst, regardless of the number of years he or she has been in practice." "I found this guided tour through the celestial realms of contemporary psychoanalysis difficult to put down. The questions posed by Luca Nicoli to Antonino Ferro, the reader’s tour guide, lead directly to the cutting-edge controversies in our field – the relevance of Freud, the contribution of Bion, field theory, frequency of sessions, differences between psychotherapy and psychoanalysis, the use of the couch, to name only a few. Ferro’s brilliant and innovative thinking illuminates these topics in a way that will stimulate readers to re-consider their own views. Each reader will want to join in the dialogue with Ferro and Nicoli. While the book is designed for the 'new' analyst, experienced colleagues will find it just as rewarding." "It is always a pleasure and a source of inspiration to read the many books of Antonino Ferro. This time, however, to use one of his many metaphors, he serves us, jointly with his intelligent young colleague Luca Nicoli, a different and particularly delicious dish. They allow us to participate in a conversation in which Ferro candidly opens his views on psychoanalysis and mainly on his creative and original way of being an analyst. This book makes it clearer why he is one of the very few real innovators of psychoanalysis in our time. I strongly recommend The New Analyst’s Guide to the Galaxy to all those readers who look for fresh and stimulating air in our centennial science and art." Luca Nicoli is a psychologist and psychoanalyst, a member of the Italian Psychoanalytical Society (SPI) and the International Psychoanalytical Association (IPA). He is also a member of the Editorial Board of the Rivista di Psicoanalisi (Italian Psychoanalytic Journal). His three books are published in Italian: Amare senza perdersi ('Loving Without Losing Ourselves', 2009), L'Arte di arrabbiarsi ('The Art of Angry', 2012), and Il Sogno ('The Dream', 2014).